James and Sarah Swank met in 2004 while they were both on paths of self-discovery. They immediately connected and started the process of creating a partnership. They traveled around the world together having adventures, exploring possibilities, and deepening their relationship. They began giving groups sharing what they had learned in Australia in 2005, briefly gave groups in the USA, before settling in Vienna, Austria where they really developed the Deep Living work while giving groups around Europe. In 2010 they settled in Berlin Germany, and focused their practice there. They currently live in the Frohnau section of Berlin where they give groups and sessions, are creating a family, creating music, and are members of a community that has developed around their Deep Living work. James Swank was born in Baltimore, Maryland in the USA. He graduated from the California Institute of the Arts with a BFA and pursued an art career for twenty years while making the majority of his living by working as a technician, technical director, or stage manager on corporate presentations for clients such as Time Warner, Viacom, Mattel, Merrill Lynch, and Drexel Burnham Lambert. At the age of 40 he began deeply questioning his life, which led him to letting go of all he had known and diving into a journey of self-discovery. He moved to Harbin Hot Springs in Middletown, California and joined the community there. Living at Harbin gave James the opportunity to dive deeply into his process and study with many different teachers, the most influential of which were Christine Day, Jeru Kabbal, Hal Meyer, and Paul Lowe. While at Harbin James completed two yoga teacher trainings and became a yoga teacher. He participated in many Tantra trainings, most notably with Anna Harvey, David Deida, and Bodhi Avinasha. He became a registered practitioner of Ortho-Bionomy studying primarily with Luann Overmeyer and Jim Berns. He studied extensively with Kathy Kain learning her form of trauma resolution. He completed a 1,000 hour program in aquatic bodywork and started a professional bodywork practice, both on land and in the water, primarily focused on helping people get out of pain. Over the years he created a unique synthesis of all he had learned in working with clients bodies, emotions, and minds, which he called PEM (physical, emotional, mental) Therapy. The work was extremely effective and soon he was asked to start teaching what he had learned in what he eventually called Healing Relationship Trainings. In teaching the work, he found that the harder part to teach was how to support his students to stop their own fear, behavioral patterns, and belief systems from keeping them from connecting deeply with their clients in the way the worked demanded. 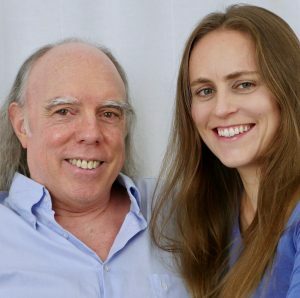 In creating a way to support his students to find the pure essence within themselves to become great healers, James created the Deep Living work along with Sarah who had joined him along the way. They found that the work was an amazing system for personal transformation. Many people who were not interested in learning to be therapists also wanted to receive the benefits of Deep Living, so James and Sarah began giving Deep Living groups and sessions. They write books about Deep Living as a way to share this work with a broader audience and are currently in the process of creating a video course. Sarah Swank Wenger was born in Basel, Switzerland where she was introduced to eastern philosophy and alternative life styles at an early age by her mother. After a study year in Australia where she became fluent in English and a travel year through India and Nepal, she focused on her study of piano with Boris Chnaider in Basel, learning music theory at the Freie Musikschule Basel. Feeling her music studies were not quite enough for her, she began a path of self-discovery studying extensively with Thomas Hübl. In time, this led her to take a group with Paul Lowe where she met James. James and her decided to support each other in their processes and she worked together with him to transform James’ professional practice as a bodyworker into, first the Healing Relationship Training, then the creation of the Deep Living work. Sarah works closely with James in all aspects of the work, organizing the business and groups, being the primary contact with clients, translating the work into German, proofreading and editing the books, and keeping their lives running smoothly and easily. As well, Sarah gives her own sessions where she shares her insight, warmth, and nourishing feminine energy, to help people see themselves more clearly and accept themselves more fully.